More than 100 Indiana State University students were recognized for achieving excellence in the classroom during fall semester. 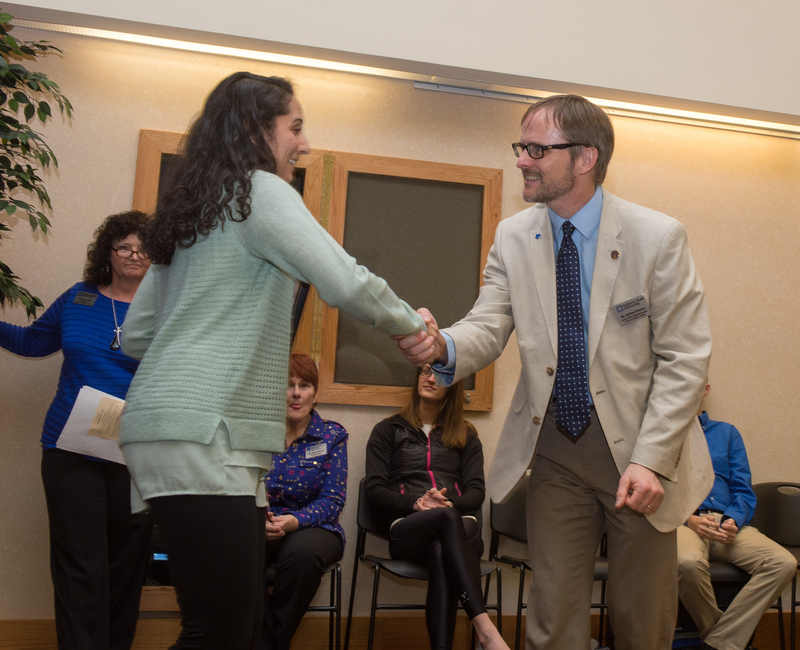 Indiana State’s Center for Student Success held the 2016 awards ceremony where faculty, friends and family gathered to recognize the students’ achievements. There were over 500 students in the LEAP, 21st Century Scholar and Student Support Services that achieved a 3.0 grade point average or higher the 2015 fall semester. “Indiana State University prides itself in its commitment to community service and community engagement. So for you [Blue Leaf recipients] to be demonstrating at a high level already while maintaining excellent grades in your own courses… that is the spirit of a true Sycamore,” said Michael Licari, vice president for academic affairs and Provost. The Blue Leaf award recipients were presented by five programs - LEAP, FirstSycamores, Student Support Services, 21st Century Scholars and the Tutorial Program. These students and a faculty member were honored for displaying outstanding participation in the Center for Student Success, being engaged in campus life and achieving a high GPA. Megan Veeneman and Kell Clothier were awarded the Blue Leaf awards presented by FirstSycamores. Veeneman, the daughter of Brian and Tammy Veeneman, is a sophomore elementary education major and member of Kappa Delta Phi. Clothier, a freshman nursing major from Logansport, is the son of Matthew and Kellee Clothier. Vanessa Shelton, the daughter of Rudi and Julia Shelton, was awarded the Blue Leaf award by 21st Century Scholars. The junior human development and family major has been dedicated to community service work and plans on spending her spring break volunteering in the Dominican Republic and is a member of Gamma Phi Beta sorority. The Clinton native, Kirrsten Todd, is the daughter of Rick and Donna Royal and Michael Todd. She was awarded the Blue Leaf award by Student Support Services due to her outstanding program participation, volunteerism and academic work. Todd is a sophomore elementary education major with a special education minor and a member of Gamma Phi Beta sorority. Anthony Turner, a freshman operation supply chain management major, earned the Blue Leaf award from LEAP based on his academic achievement and high participation in campus resources and the LEAP Leadership Program. Turner is engaged in the community and pushes himself to success according to Jim Pond, student success coordinator and LEAP advisor. The tutorial program gave out three Blue Leaf awards at the ceremony to an outstanding tutee, tutor and supplemental instruction leader. The outstanding tutee award was awarded to Emily Scully, a freshman athletic training major from Dana, Indiana. She is the daughter of Dan and Jan Scully. Scully participated in the tutoring services by demonstrating her readiness to improve academically and never missed an appointment. Priya Abhyankar, daughter of Ramachandra and Rashmi Abhyanker, was recognized as the tutor award. Abhyankar, a pre-medicine and anthropology major from Terre Haute, is a member of Chi Omega. The third Blue Leaf award presented on behalf of the Tutorial Program recognized senior social work and psychology major, Lakisha Johnson. She is the daughter of Robert Johnson and Christine Sanders of Queens, New York. Johnson was awarded the Supplemental Instruction Leader award. Abhyankar and Johnson were honored with performing outstanding customer service, their desire to help others and are student role models in the community. Paul Asay, a system administrator in the Cunningham Memorial Library, was awarded a Blue Leaf award on behalf of the Tutorial Program. This was honored to Asay for his creation of an online scheduling system for tutoring and other improvements to the tracking systems for supplemental instruction and the Center for Student Success. “I love it when our students are successful,” Licari said. 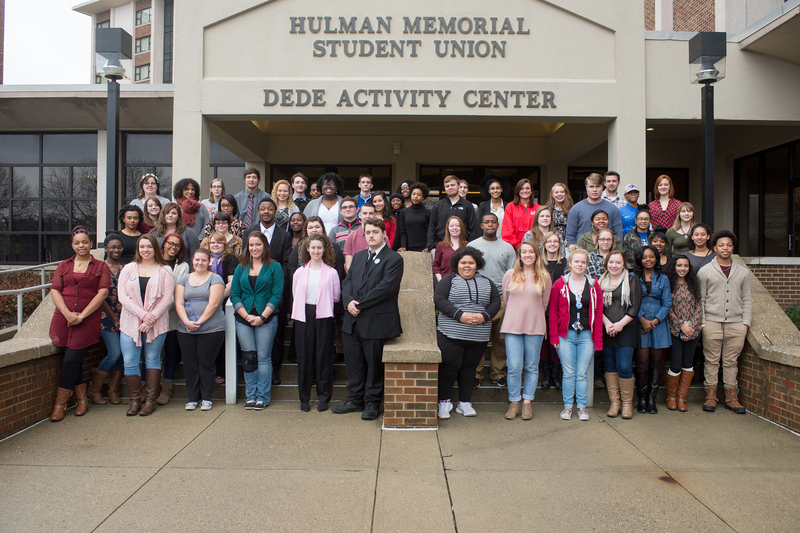 More than 100 students were recognized for achieving excellence in the classroom during fall semester. The Center for Student Success held the 2016 awards ceremony where faculty, friends and family gathered to recognize the students' achievements.